SAVCO (Servicios Aereos Virgen De Copacabana) DC-3 CP-1128 (1998) at Cochabamba. 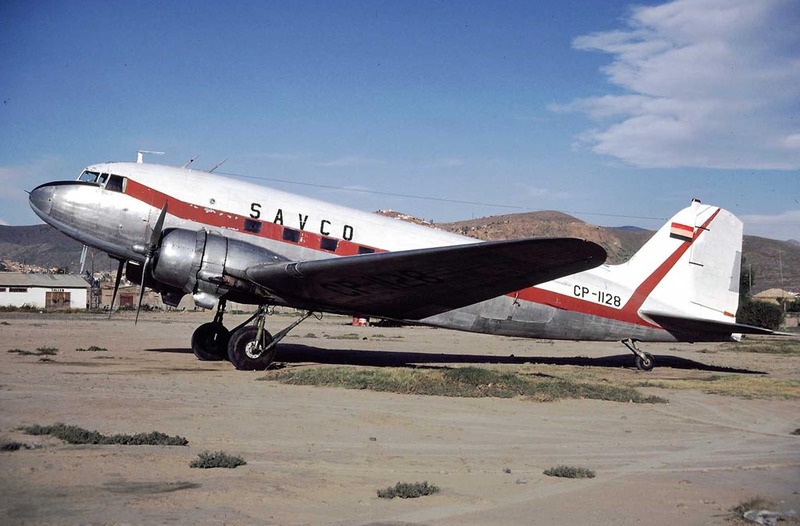 Savco was founded in 1970 and undertook most charter services within the center of Bolivia, using mostly DC-3s and C-46s. Briefly two DC-6s were employed in the early 1970s. 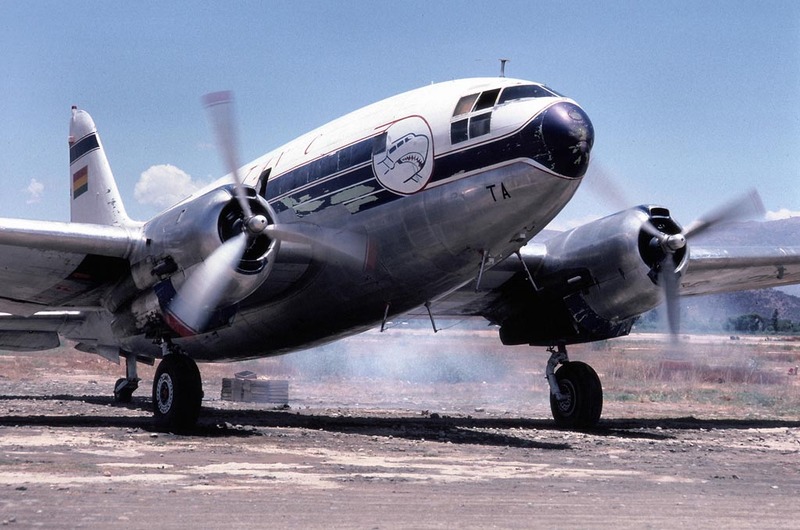 This DC-3 later flew with Lineas Aereos Canedo. 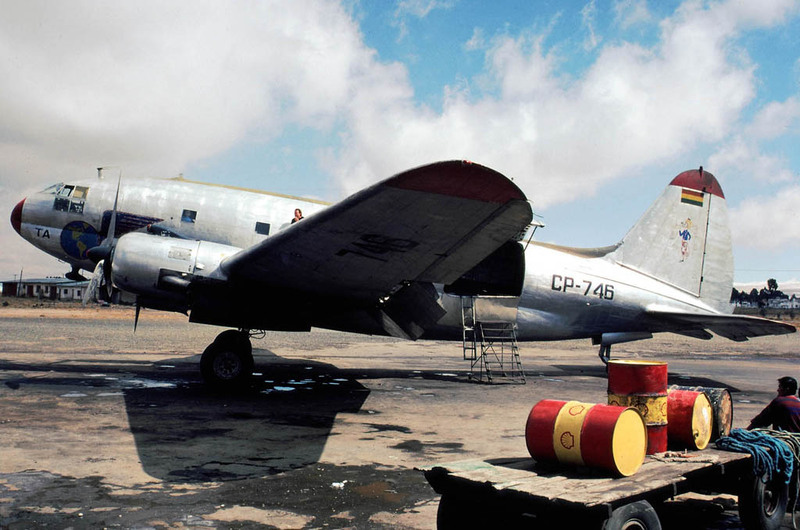 Currently this DC-3 is a survivor and resides at Cochabamba airport awaiting a new future. 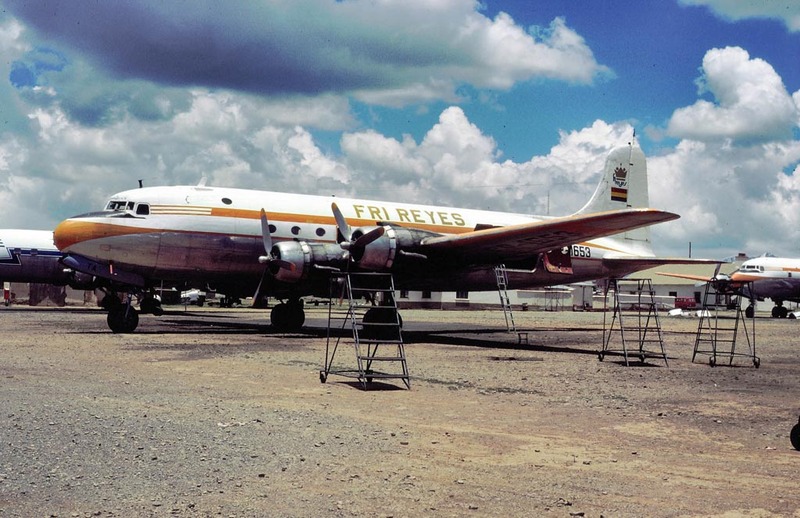 Fri Reyes (Frigorifico Reyes) DC-4 CP-1653 (10285) parked at La Paz El-Alto airport. Fri Reyes was the largest meat haulers company in Bolivia. They started flying since the 1960s and became famous for flying the last civil Boeing B-17s across the Andean mountains. After the B-17s were sold to the US, Fri Reyes purchased eight Convair 240s from surplus US stocks. 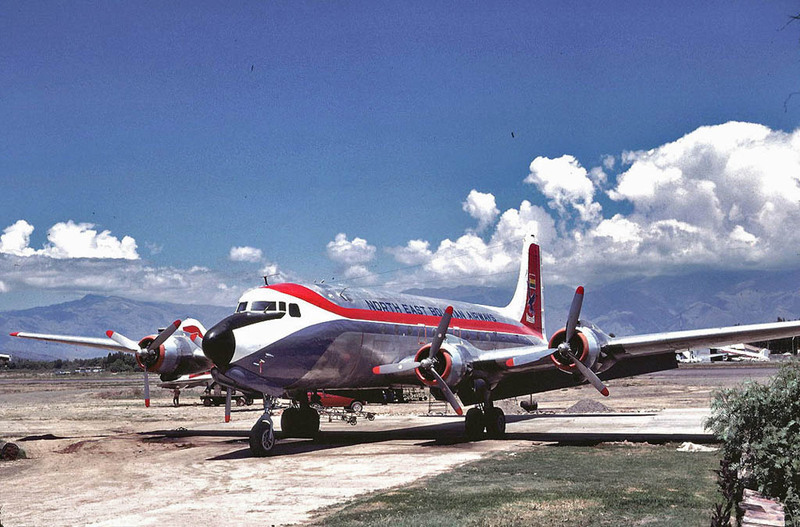 Then in the late 1970s several DC-4s where bought to supplement the fleet. 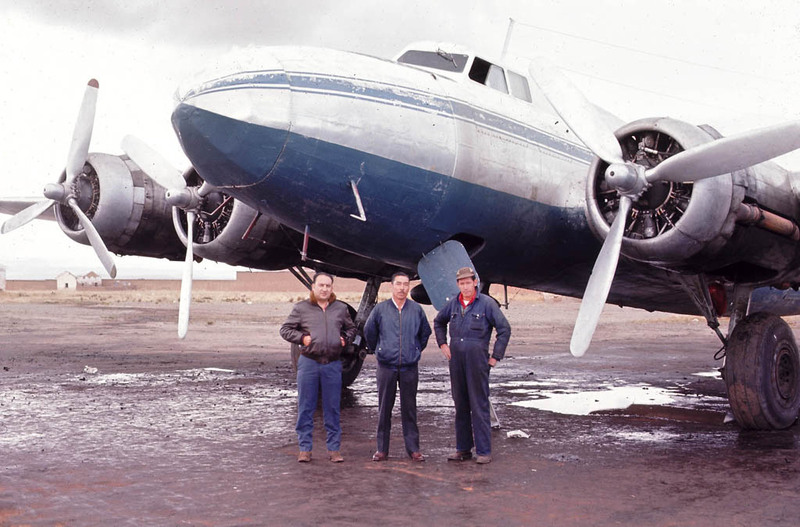 In 1981 Fri-Reyes acquired all surviving piston aircraft from Faucett in Peru, namely two DC-4s and two DC-6s. By early 1990s its fleet had been reduced to just a few aircraft, due to many accidents and dwindling business. CP-1653 met its fate at La Paz, Sept 1988, when engine problems forced the crew to make a belly landing. The aircraft caught fire. 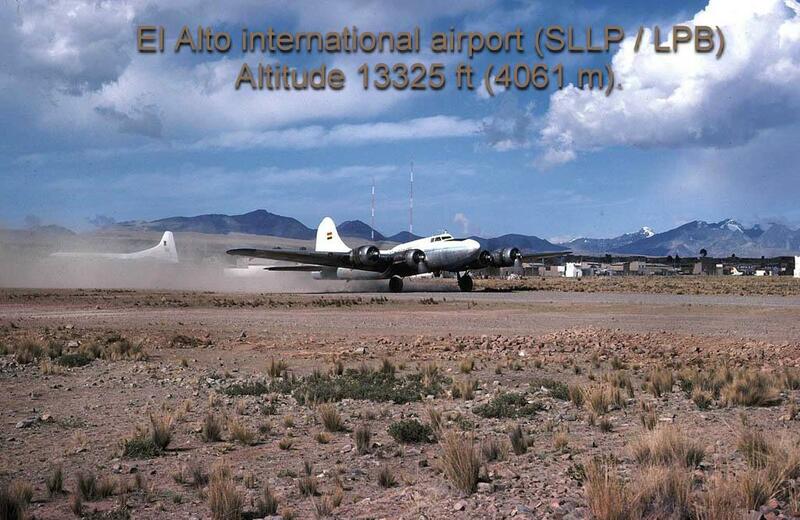 B-17E CP-753 (2682) El Tigre first arrived in Bolivia in July 1964 with Compania Boliviana de Aviacion. Previous operators include Lysdale Flying Service and Canadian Kenting Aviation. She was involved in several mishaps, such as a Port undercarriage collapsed while taxiing at La Paz (1974) and a crash at while landing at San Borja (1976). She was rebuilt and sold to the US and was ferried to Florida March 1990. Sister ship B-17G CP-891 (22616) ex CP-627. This aircraft was saved and brought back to the US (1981) and can be seen as a static display at March AFB museum CA. CAN (Compañia Aérea Nacional) DC-6 (43035/61) CP-1654 (ex American Airlines) ay from the meat haulers gravel ramp to El Alto main runway. This DC-6 was purchased from Empresa Transportes Aereos (ETA), another La Paz based cargo airline, which painted the pink panther as a symbol on the DC-6 tail. Devoid from any paint the old American Airlines cheat line can still be seen. 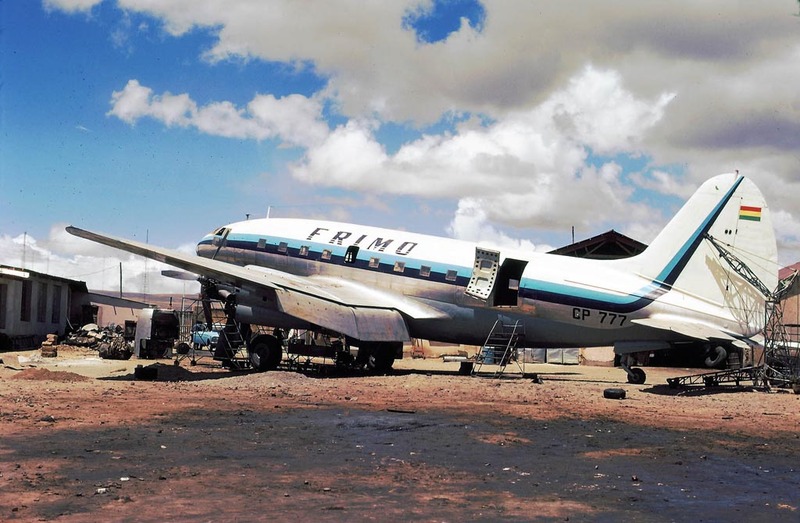 The DC-6 met its end at Santa Rosa Airport (Bolivia) March 1993, when its no. 2 engine backfired just after V1 on takeoff. The pilot aborted takeoff and the DC-6 overran the 1500m grass runway. The engine caught fire and destroyed the aircraft. 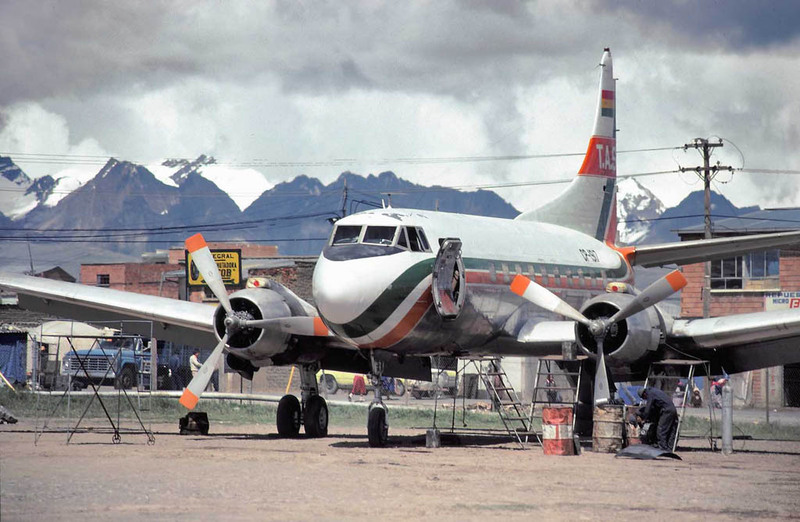 Universal C-46D-10-CU CP-1655 (33294), undergoing maintenance at El Alto airport, Bolivian style. 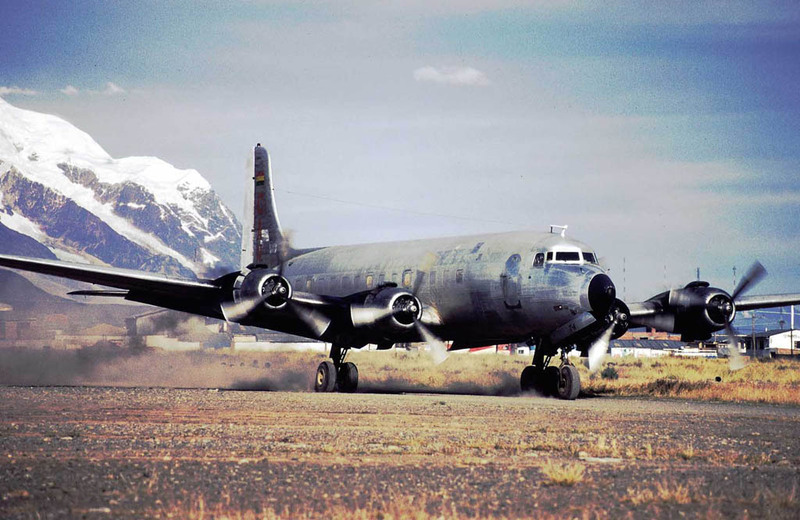 This freight company began operating around 1977 with two C-46s. 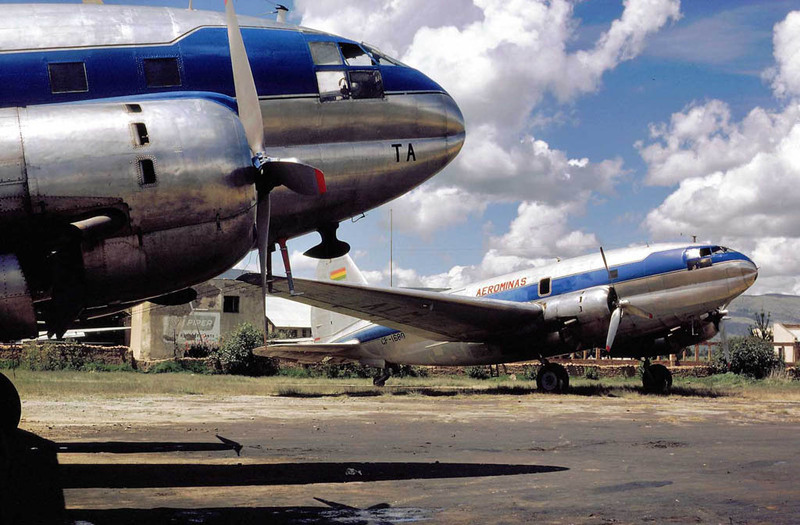 During January Universal lost half of its fleet when one C-46 was lost in an emergency landing at La Paz. CP-1655 is photographed in basic TABA livery from whom they purchased it back in 1981. She has a checkered career flying with LB Smith, Transair Congo, TABA (Transportes Aereos Regionais da Bacia Amazonica S.A.) In 1995 the aircraft was registered CP-1655 and owned by Servicios Aereos Cochabamba in Bolivia. In 1997 with the same registration the new owner was Servicios Aereos Oriental and 1998 there was again a new owner, Transportes Aereos Universal Ltda. Finally in 1999 the aircraft was still in use and now as CP-1655 with SAO (Servicios Aereos del Oriente). Currently CP-1655 is one of a handful surviving piston engine aircraft’s in Bolivia and she is parked at La Paz airport and is for sale! Aerominas (Aerovias Las Minas Ltda.) 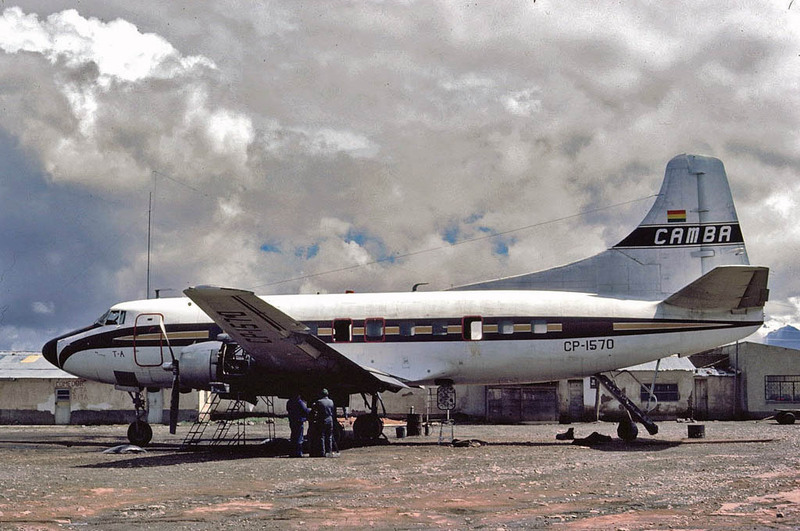 C-46F-1-CU CP-1680 (22596) parked at its Cochabamba base. Aerominas was founded in 1964 and its prime business was non scheduled cargo and freight services throughout Bolivia from Jorge Wilsterman airport. Aerominas main equipment was the sturdy Curtiss C-46 Commando. Over the years at least 14 examples have passed through there hands. It had also briefly operated a single DC-6 freighter. Panambra Ltda. Convair 340-62 CP-1737 (236) is seen here warming its engines prior to another cargo flight out of the El Alto dirty ramp. 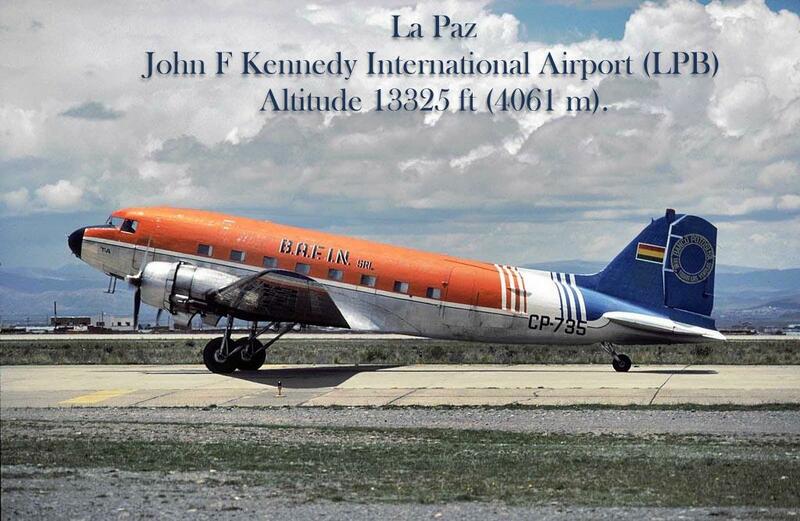 This small cargo airline was based in La Paz and began operations around 1980 with a single Convair. 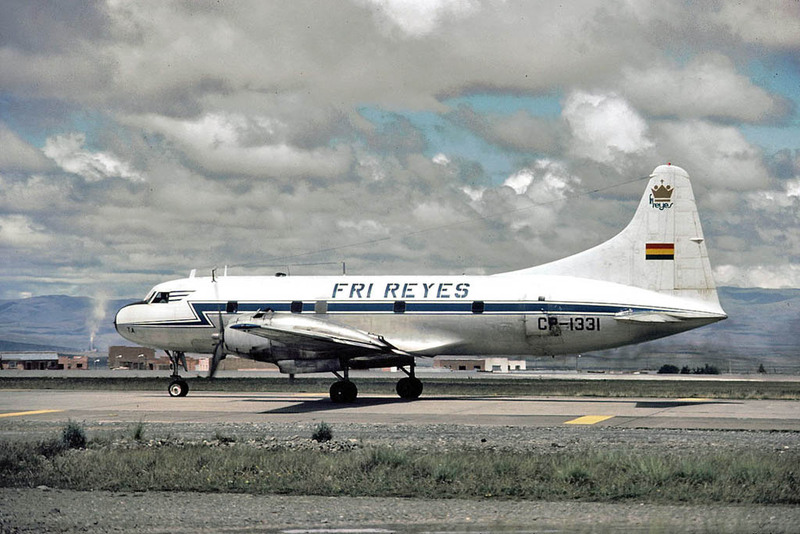 This ex Fri Reyes Convair was damaged at La Paz and replaced by another example. TASS (Transporte Aereos Samuel Selum) ex Eastern Airlines Martin 404 CP-1917 taking it easy La Paz El Alto airport. TASS was founded in 1984 and operated two Martin 404s as freighters on domestic meat hauling flights. One of the Martins was destroyed after take off from La Paz during April 1990. 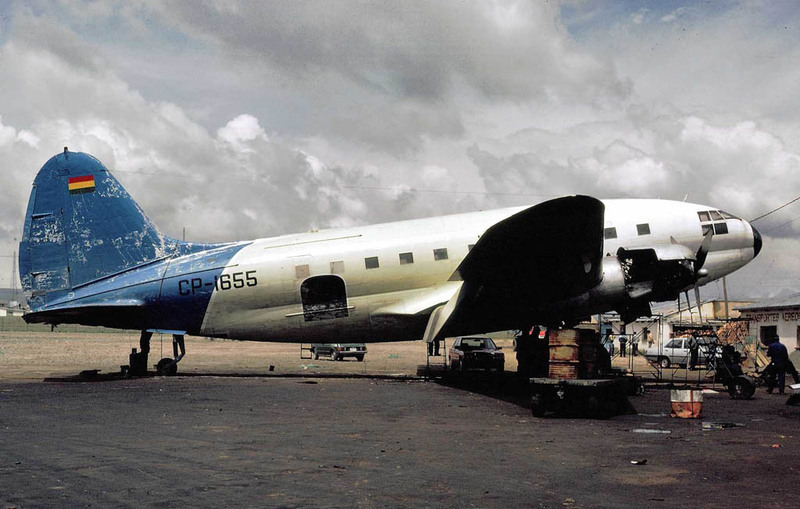 Sister ship CP-1738 was damaged beyond repair while operating for Air Beni. 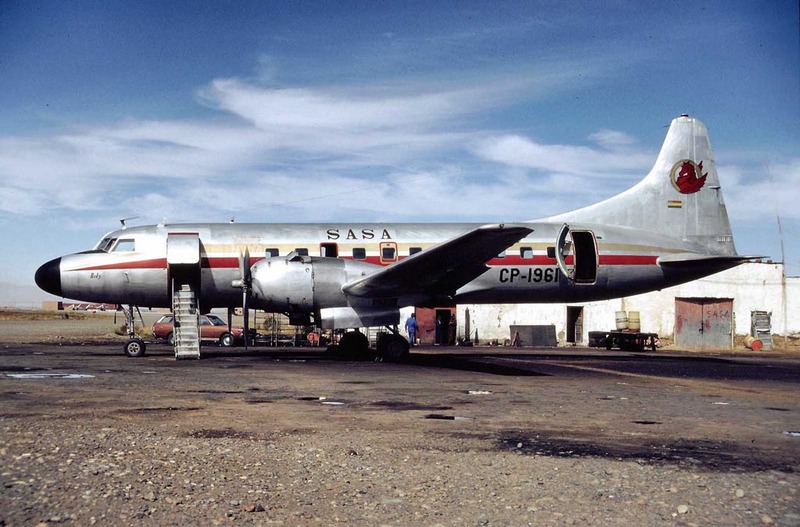 SASA (Servicios Aereos Santa Ana) Convair 440-80 CP-1961 (405) in between cargo flights at La Paz airport. This cargo operator, based at La Paz, utilized a small fleet of twin engine Convair 440s. Whilst operating for SASA (august 1992) the aircraft crashed into Chacaltaya Mountain at FL150, what caused this crash remains a mystery until today. Sister ship CP-2142 was also unlucky; she crashed while making a forced landing at San Borja after an engine failure (05-95). SAO (Servicios Aéreos Del Oriente) C-46A-5-CU CP-746 (26417) is seen here awaiting a next load of cargo. She was photographed (1997) at La Paz El Alto typical oil soaked ramp. The pink panther tail logo is a reminder of her previous operator TA Universal. This C-46A, which was delivered to the USAAF as 41-12290 in February 1943, has served with various cargo operators. 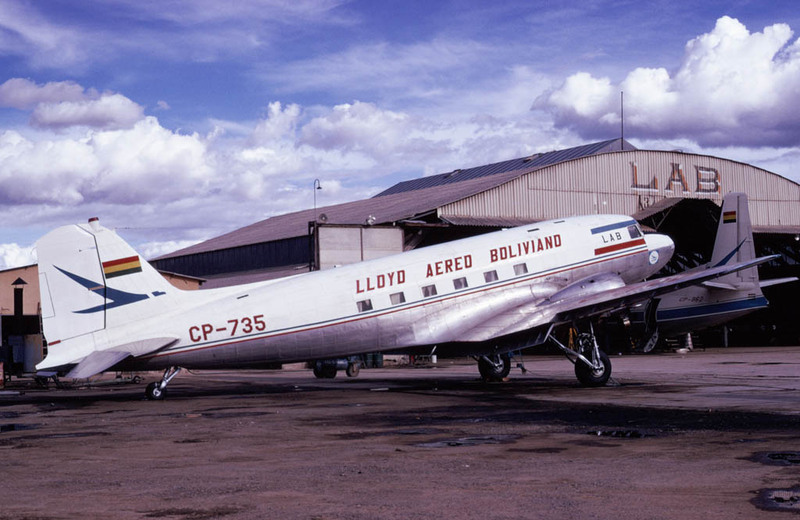 In 1966 she went to Bolivia as CP-746 with Bolivian Air System. The faith of this C-46 remains unclear she is believe to have been damaged beyond repair in an emergency landing at La Paz. 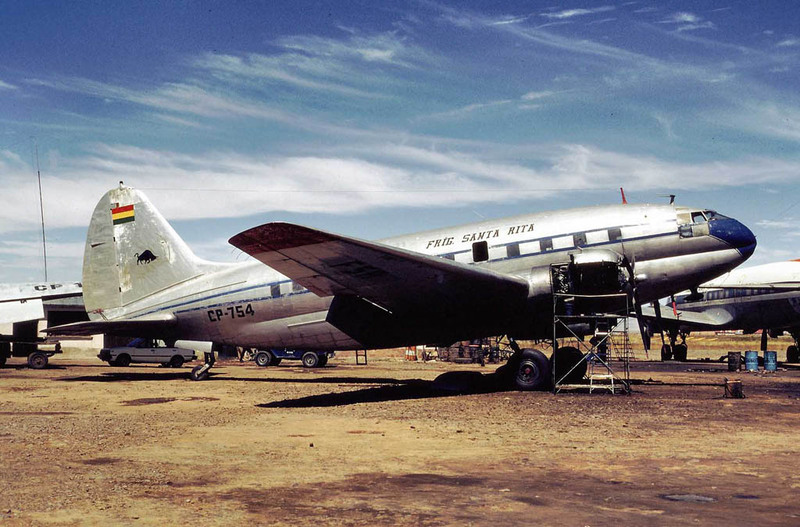 FRIMO (Frigorificos Movima) C-46D-15-CU CP-777 (33479) is seen at La Paz with a fresh coat of paint. 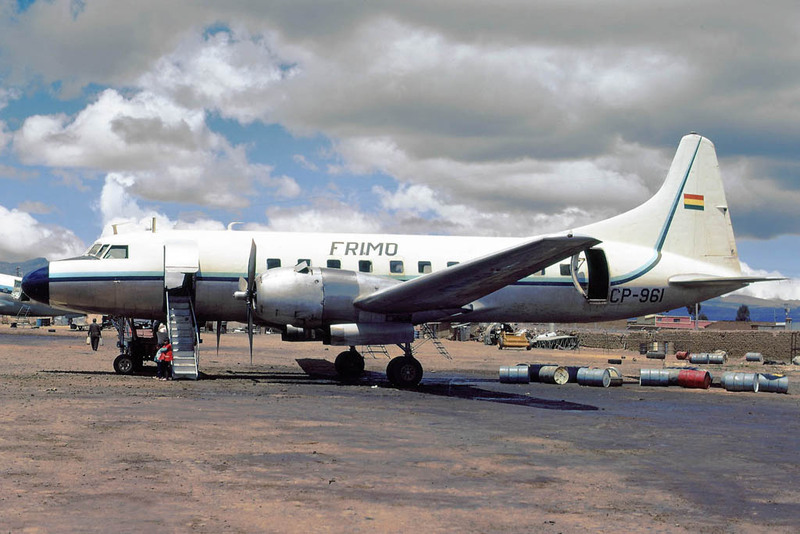 FRIMO was one of these typical cargo operators based at La Paz using C-46s and Convair 440 aircraft. 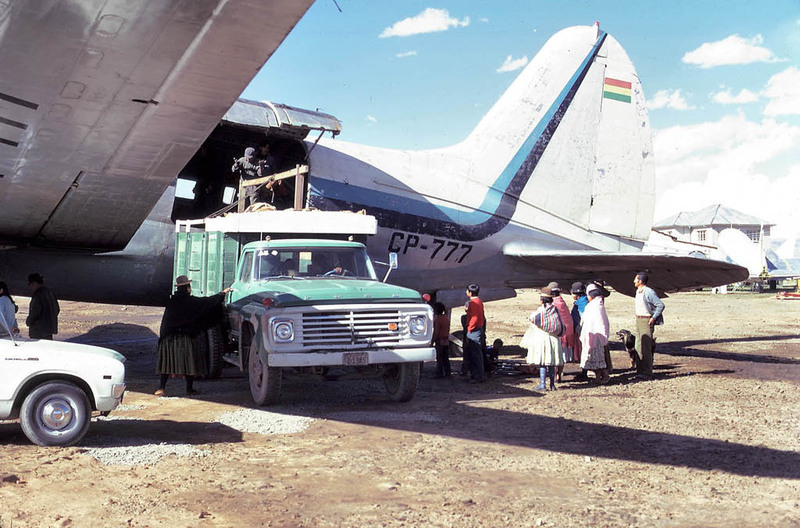 Curtiss CP-777 arrived in Bolivia during July 1967 with Transaereos Frimo. 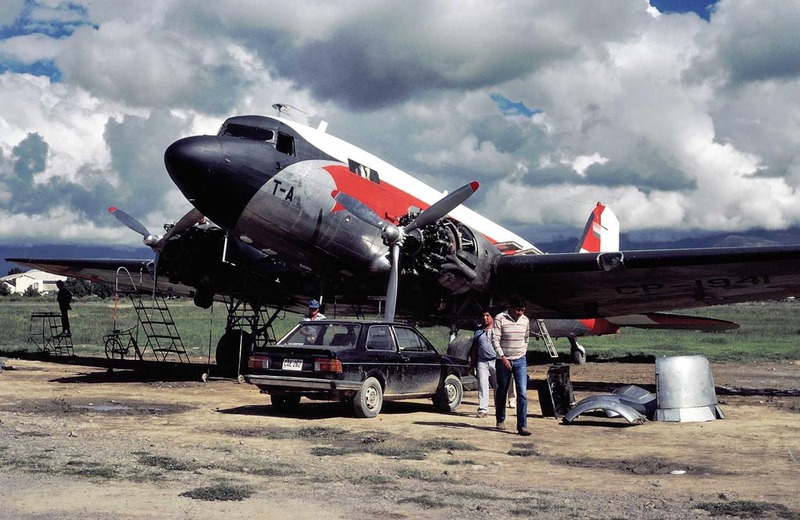 This C-46 came to premature end, when during December 1979; she crashed 15 km from La Paz airport on approach. NEBA (North East Bolivian Airways) C-46A-40-CU CP-1616 (27055) is seen taxing out to the active runway. 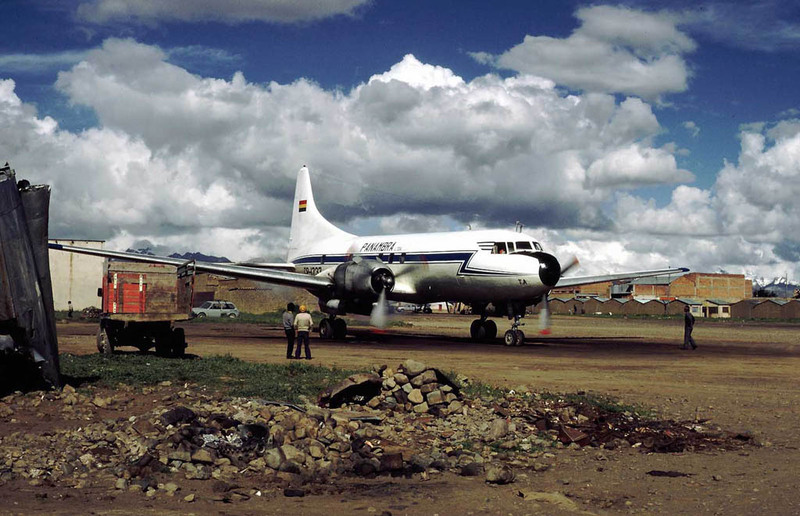 NEBA was a small cargo airline based in Cochabamba operating at first with a single DC-4 and later with Convairs and C-46 freighter. 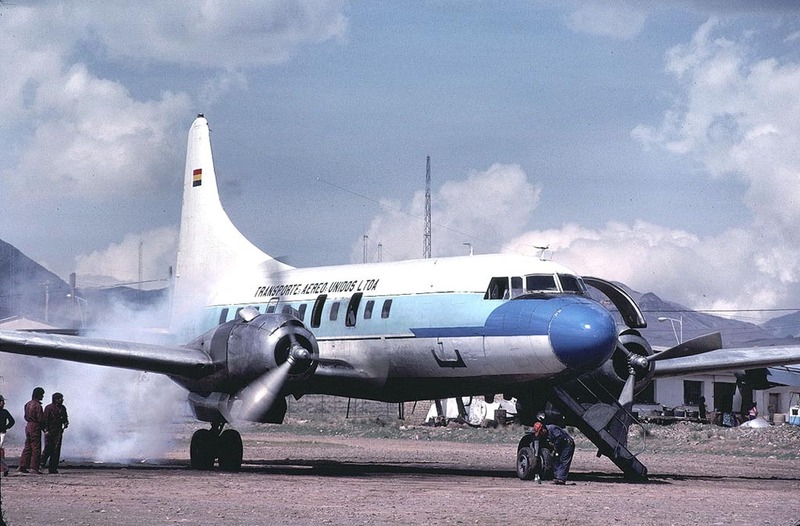 Convair 440 CP-924 was lost in an emergency landing near Cochabamba May 1990, leaving the airline with a single C-46. She was damaged beyond economical repair when she slid of the runway at Trinidad airport Bolivia December 1988. She still lingers on between the weeds of Trinidad airport. 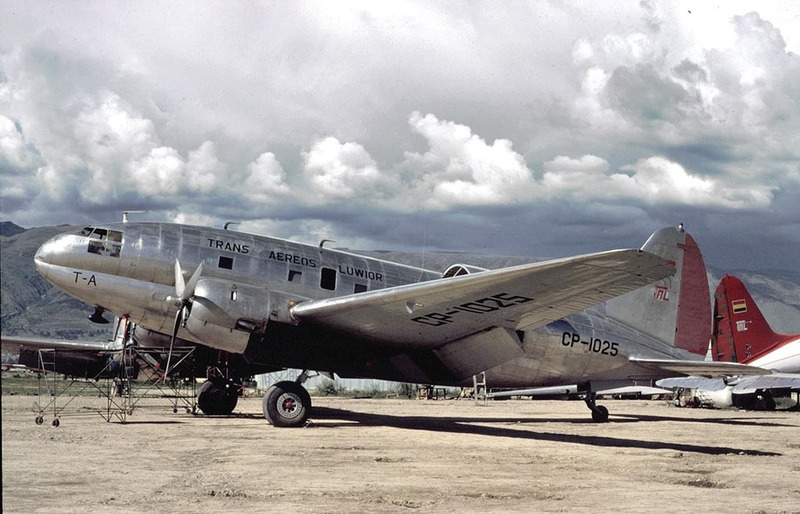 Trans Aereos Luwior C-46F-1-CU CP-1025 (22436) arrived in Bolivia in February 1973 for SAVCO. This small cargo airline was founded in 1979 and operated out of Cochabamba airport. 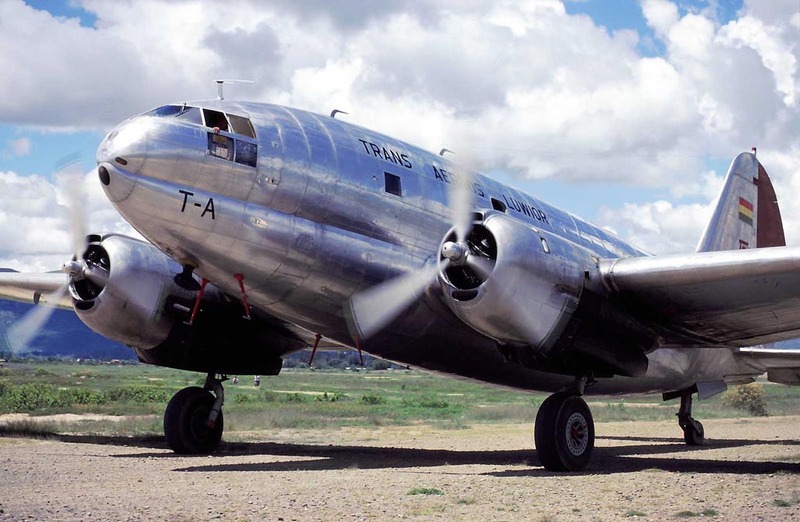 It operated mainly the C-46 in a simple bare metal colourscheme. This is the scene at Cochabamba Jorge Wilsterman airport with CP-1025 running her 2000-hp Pratt & Whitney R-2800-51 radial engines prior to another freight run to the Beni low lands. TAVIC (Transportes Aereos Virgin Del Carmen) C-46F-1-CU CP-1280 (22569) just fired up both her engines. CP-1280 first arrived in Bolivia in October 1975 and was operated by Savco. This aircraft was delivered to the USAAF in September 1945. Post war it flew with All Trans airlines and Flying Tiger Line. After Savco it went to Trans Aereos Luwior flying in a plain white color scheme. Early 1990s Tavic became the proud and restored it in the vintage Flying Tiger Line color scheme and was used as a meat hauler. 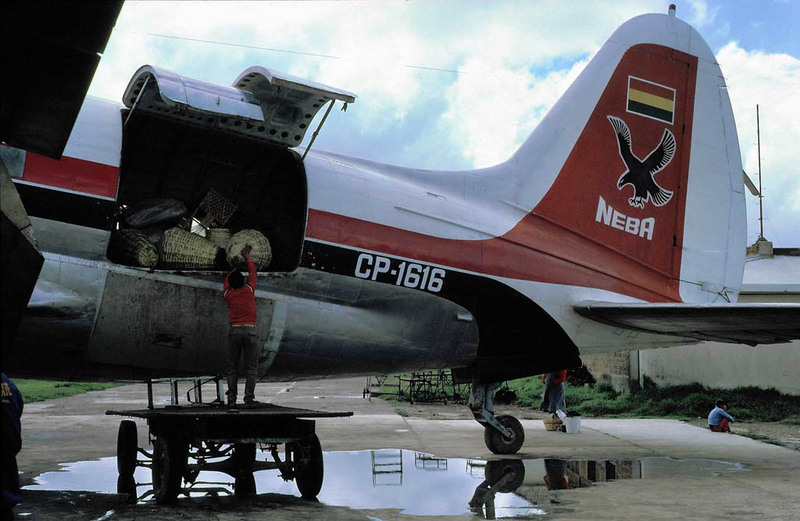 NEBA C-54G-10-DO CP-1090 (36036) arrived in Bolivia late 1970s and flew for TURMO based out of La Paz. She then moved to Cochabamba when NEBA purchased her. 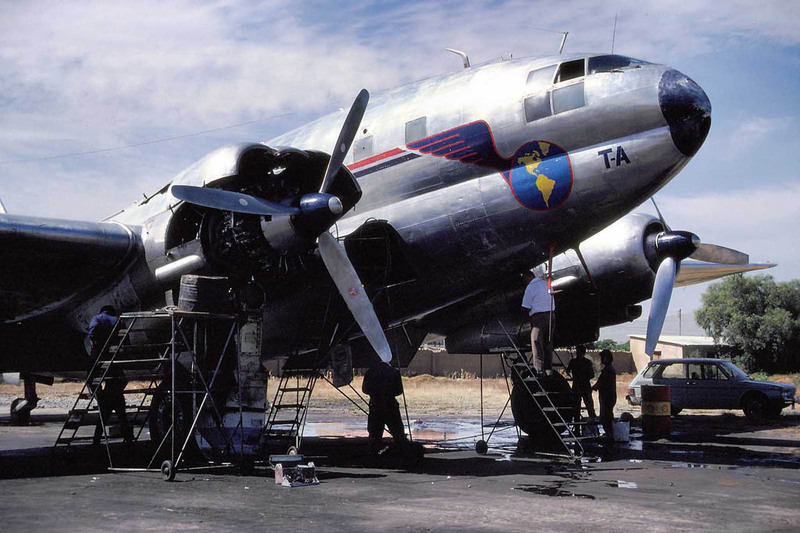 This beautiful Skymaster did not survive for long, when January 1984 she returned to Cochabamba-Jorge Wilsterman airport because of a no. 2 engine failure. Propellers contacted the runway upon landing, causing the aircraft to run off the side of the runway and strike a drainage ditch. Transporte Aereos Unidos Ltda Convair 440 CP-1574 used to Eastern Airlines and then later for Mackey International Airlines from Fort Lauderdale FL as N447JM. She was sold to Bolivia and flew with Aero Santa Rosa, Pamambra and Transportes Aereos America. Her faith remains a mystery. CAMBA (Commercializadora Aérea Mixta Boliviana) Ltda Martin 404 CP-1570 (14167) was photographed at El Alto airport. CAMBA was one of those typical cargo operators using the twin engine Martin 404s and a single Martin 202.Additionally they also used a C-46 and a Convair 440. CP-1570 did not survive Bolivia. One of her Pratt & Whitney R-2800 engines backfired on a test flight and made a forced (belly) landing at Paraparau Bolivia. All Martin 404s crashed…which is unusual in Bolivia. The captain of sister ship CP-1317 discovered cattle on the first part of the runway at El Peru airstrip, which forced him to touch down about halfway down the wet runway. The left main gear collapsed as it struck a pot hole. The aircraft veered to the left and overran. LAB Douglas C-47B CP-735 (16805/33553) to Vibar DBR at 22-10-1975 Wfu. Aviation safety Network/Harro Ranter, Air Britain Publication 1982 Bolivian register. Ron Mak, Chris Mak, Jan Koppen, Peter van Oostrum, Hans Huizing, Agullo Francisco, Roberto Canedo & Werner Fishdick slide collection.